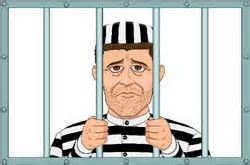 Before I set even one foot onto the WordPress savannah, to begin this meet-the-bloggers safari, I found that I was being treated like a criminal – an alleged criminal, a might-be criminal. What’s worse is, I have to admit that it’s valid. The first stop on our trip will be a short visit with Cordelia’s Mom, in the Buffalo area. Like me, she had Cordelia, a daughter who already had a blog site. Like me, her daughter pushed her in front of a blog-bus on the information super-highway. Since Shimoniac and I are both about as dangerous to anyone, male or female, as a stuffed Tickle Me Elmo doll, I naively assumed we might meet at the home of one or the other. Not so! We’re online daters, not to be trusted till we prove we can be. We will wisely be met at a very public place. As CM noted, “It’s not as if the writer of a long-established blogsite would turn out to be an axe-murderer.” but there are other disturbing possibilities. I realise that it’s just as true for us. If Shim and I follow Hansel and Gretel into the gingerbread house, we might end up being sold to white slavers. If so, it better be by the pound. If I cease posting, you’ll know that colonoscopy thing was just for practice. Actually, since this trip is planned to last five days, I won’t be posting anything till early next week. Don’t despair, and please return then. 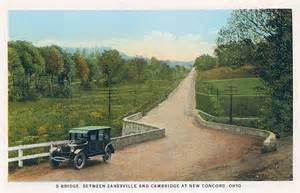 After most of a day and a night in Buffalo, we plan to wend our merry way through the Amish Paradise of eastern Ohio, to the country mansion of the Baron of the Blogsites, John Erickson. John has been off the air since about the middle of July. Repeated emails from both AFrankAngle and me have produced no response, either from John, or his wife. We fear the worst, but hope for the best. While I don’t have permission to just show up, I still plan to stop by his place unannounced, to see if we can get some information. So John, if you’re reading this, that’s not the Fuller Brush man, or Avon, knocking on your door. Failing contact with J.E. or Mrs E, I have a letter I plan to leave, telling of all our love and how we miss him, and urging him to rejoin our community. 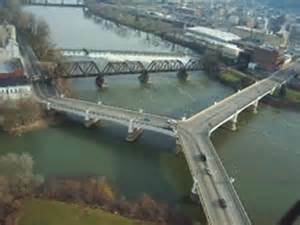 I thought John, and perhaps his wife, might like to accompany us to the knife show just to his south, and possibly over to see the Y-shaped bridge in Zanesville, and a couple of strange S-shaped bridges nearby. The best-laid plans never survive the first contact with reality. The greatest chance of any success is to adapt, as much and as quickly as possible. The son booked all three of his weeks of holidays in the summer “shutdown”, when it’s really hot in the plastics molding plant. He asked for a week of leave-of-absence for this trip. In previous years, others have asked and were quickly granted. After five weeks of no answer, he was suddenly told by the plant super, that they are just starting a new, large contract, and his leave was denied. The curse of being indispensible. In all previous references to Shimoniac, and subsequently, please read, Granma LadyBug. The wife is stocking up on antihistamines and accompanying me for an abbreviated trip. The day we wish to leave, Cordelia has an unbreakable business meeting. We will be met instead by Cordelia’s Mom, and her mother-in-law. While BrainRants says he’d like to meet, he has urgent family affairs to handle this weekend. Perhaps another time…. We can only hope to find the reckless recluse, John Erickson. This thing is coming apart faster than wet Kleenex. ….if you would read this blog….and comment on it….and tell your friends about it. Hello??! Is anybody out there? Is this mike keyboard on? Every blogger appreciates getting comments and feedback from their posts. We all want to know that we’ve reached someone, gave them some new information, or a new way of looking at something. Clicking *like* tells them that we’ve read the post, and felt it was good/interesting/worthy, but, stopping to make a comment tells a blogger that we’ve been more intimately involved with their thoughts. Whether it’s just a little throwaway joke, or a deeply philosophical review of a complex subject, writers like to know that they’ve affected someone. The more comments they get, the more connected they feel to their readers, and the happier they are. There’s a new spate of blog awards making the rounds. One of my newer Best Blog Buddies, Nicole, over at www.nmnphx.wordpress.com, despite being busier than usual, both at work, and just with life in general, has had four different blog awards lobbed at her in the last week. After reserving one free minute to take a deep breath, she has managed to deal with all of them. As usual, the terms of all of them are that, if you receive it, you must scatter copies of it, like flower petals in the wind. She and I have been making free with comments on each other’s posts. I have appreciated seeing her bright words below my prosaic posts. Apparently she has felt much the same about my inane pigeon droppings responses. 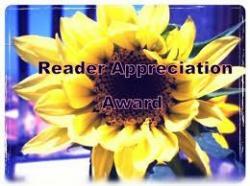 So much so in fact, that she has deemed me worthy of the prestigious Reader Appreciation Award. This award is bestowed upon blog visitors who are regular and reasonably intelligent commenters. Well, I got one out of the two nailed. I’m working to be sure I have my brain in motion, before I engage my mouth. At least all I have to do for this award is appreciate it. None of this telling you seven, or ten, or the square root of 144 things about myself. I’ve already listed so much stuff about me that even I’m surprised. Aside from blogging, the last new thing that happened to me is still carved into the cave wall. I am supposed to pass this award on to five to ten visitors to my blog who make me feel good by regularly commenting. Five to ten sounds like a prison sentence, and I’ve already got my five hardened criminals blog-friends picked out and will notify them as I post this. If the following folks don’t feel any sillier than I do, feel free to mosey on over to the Archon’s Corral and pick up a pretty little picture to hang on your blog wall. There are a few more that I could mention, but I’m too damned lazy right now. There’s more exciting Olympics to get back to. If you feel your name should have been included but don’t see it, please don’t be offended. These blog awards come around more often than door-to-door driveway sealers. The next time I get swatted with one, I’ll list some different names. BrainRants comes to mind, but his comments have fallen off a bit because he’s busy saving the world from power-point presentations. After he gets back I’ll see if I can find a logo that features a tank, or at least an M9 Beretta handgun. How you please yourself or your significant other, in the privacy of your own home is your own business, but if you want to please a bunch of bloggers, wash your hands and leave a few nice comments. We’d all appreciate it.